Raise Your Horns - ZineWiki - the history and culture of zines, independent media and the small press. Raise Your Horns, a zine about the metalhead life, published in November 2018. Raise Your Horns is a one-off perzine about the metalhead life, written by Hadass S. Ben-Ari, creator of Purple Myrtle Squeegy - A PMS Perzine and Fallopian Falafel, based in Jerusalem, Israel. The one and only issue was published in November 2018 as part of ZineWriMo. 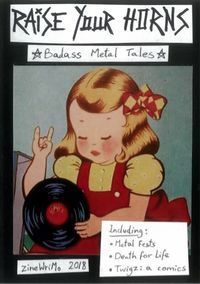 In this zine, Hadass talks about her introduction to metal, the bands she likes, the concerts she went to, a piece about the Jerusalem metal scene, and includes a poem, a collage and a segment of the comics "Twigz". This and other zines and art by Hadass are also available for sale at PMS Mess! Etsy Shop. This page was last modified on 20 December 2018, at 05:23.